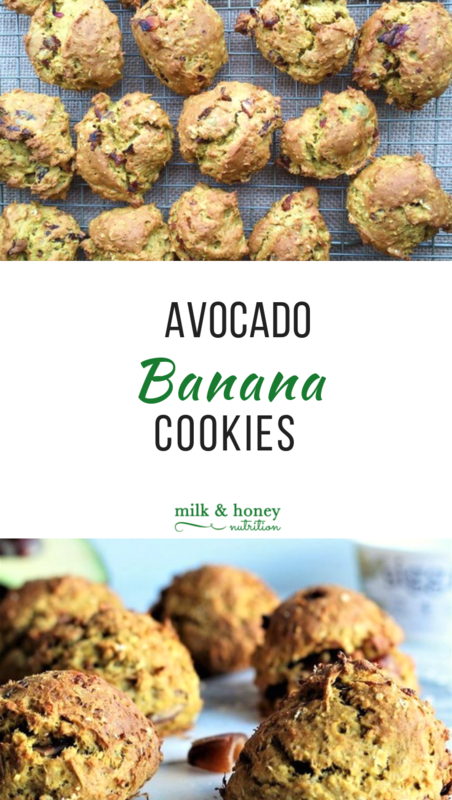 These avocado banana cookies are a great on-the-go breakfast option, snack idea, or just a tasty treat! They are made with real simple ingredients and sweetened with just bananas, dates, and the small amount of sugar found in Siggi's Vanilla yogurt. Combine wet ingredients in separate bowl and mix well. Mix dry and wet ingredients together. Stir in dates by hand. Line baking sheets with parchment paper. Using a 1/4 cup measure or standard size ice cream scoop drop on baking sheet 1 inch apart. Bake for 20-25 minutes until set and starting to brown. Let cool on a wire rack. This recipe will make about 24 cookies. Vegan recipe modifications: Eliminate eggs and yogurt. Increase pumpkin to 1 cup, and add 1/2 cup unsweetened applesauce. High protein recipe modification: Replace 1/2 cup whole grain flour with 1/2 cup of your favorite protein powder. Check out these other great breakfast recipes!